Doubling in performance almost year on year, with driver improvements and process technology being the lead factors for the advancements in GPU technology – graphics cards have certainly come a long way since the days of the GeForce 8 Series. With lower requirements, faster clock speeds, and drastically increased shader cores, the efficiency and gains being made within the ever-evolving nature of GPU architecture continues to deliver incredible performance as times goes on. Given the catastrophe caused by the recent issues relating to Bitcoin mining with graphics cards now seeing unfriendly price increases – where and when available – overclocking may be the best solution for the short-term. Thanks to technologies such as Nvidia’s GPU Boost allowing for additional performance at no extra cost, as well as the incredible improvements to GPU drivers, those willing to take this one step further by the means of manual overclocking have been lucky enough to receive improvements that make upgrading to the next tier of GPU quite pointless. With those such as the GTX 560Ti, GTX 780 and GTX 970 being incredibly refined within the design of each respective GPU architecture, free performance is literally on the table for those who are willing to go the extra mile. Before we discuss the process of extracting free performance from the chip that drives your gaming experience, let’s take a look at how overclocking works. This guide is intended for beginners seeking extra performance with a simple solution. 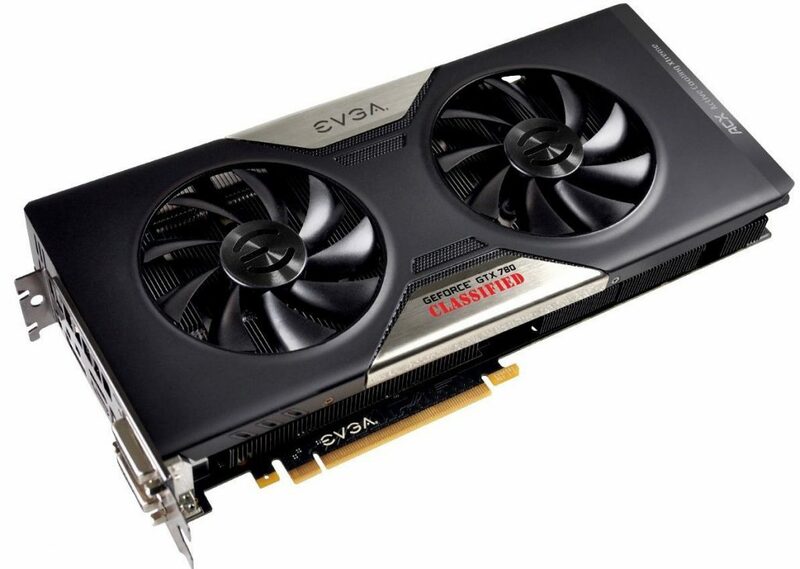 Graphics cards feature a specific number of shader cores, each running at a specific clock speed within the confines of thermal limitations and safety of power regulation. 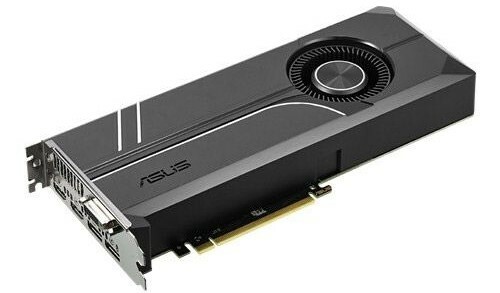 Designed to automatically adjust the frequency of clock speed according to the requirements of the game or application in question, the graphics card will output a certain amount of heat, as well as drawing a specific amount of power in order to meet the needs of the task. The principle for how this relates to in-game performance is simple: increase the amount of voltage the GPU is able to handle in order to increase the frequency at which the GPU operates. This in-turn leads to higher frame rates for an improved gaming experience. While graphics card vendors will naturally take the reference specifications of a graphics card and make further adjustments which they themselves see fit for maximum operation, headroom is left over for manual overclocking, allowing users to push the card higher for even greater performance. How exactly does one go about this should they wish to receive free performance? First things first, research the performance capabilities of your graphics card. 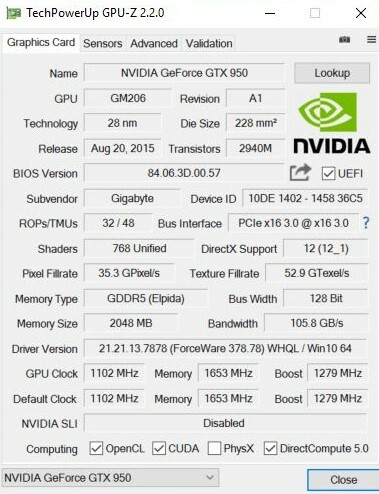 If you own a GTX 1070, take a quick browse through the internet and see what others have been able to achieve with that specific brand and model of the GTX 1070. It’s worth noting that not all GPUs will achieve the same level of performance improvements even if it’s the same graphics card. This is because of the way processors are manufactured and despite being rated for the same specifications, the physical die of the processor will differ from one to another. Without that being said, users should expect no more than a 10% difference in performance if they were to follow the exact same steps as another owner of that graphic card, so long as their set-up is identical or similar enough. This in itself will be highly unlikely, but due to the fine tweaks and adjustments from the manufacturer, near-identical performance should be attainable. Once this information has been attained it’s time to start overclocking. Begin by downloading the following pieces of software: GPU-Z – this will provide us with specification details of our graphics card. The second piece of software will be for overclocking. While many companies such as Asus, Gigabyte, Zotac and MSI will each have their own variants – each with specific advancements and features to their own brand of GPUs, the software itself will remain universal and operate in the exact same manner. For this article we’ll be using MSI Afterburner. The third piece of software we’ll need is FRAPS. This will provide an overlay indicating the current frame rate of the benchmarking tool in question, which brings us to our fourth and final piece of required software – a benchmarking tool which we can measure performance against. While there is software available that can be downloaded free of charge that will prove adequate for the process of overclocking, it’s best to use an actual game featuring it’s own built-in benchmarking tool, as this will most certainly be closer to real-world gameplay as opposed to the available software. Popular amongst the audience is Unigine Heaven and 3DMark. 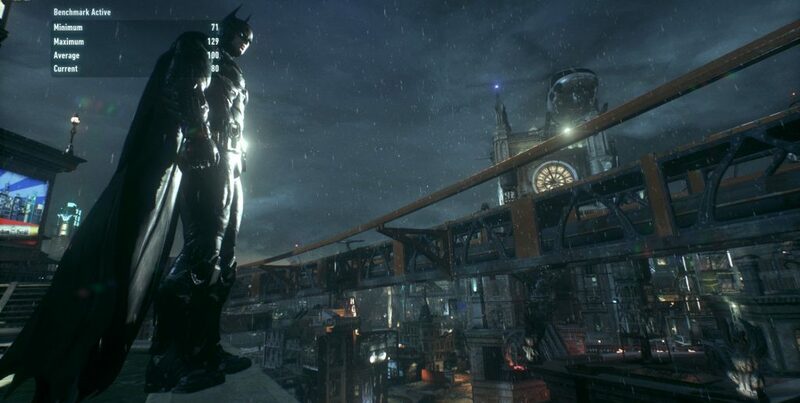 Those such as Rise of the Tomb Raider,Gears of War 4, Batman: Arkham Knight, DiRT Showdown, Tekken 7, Metro: Last Light,and Sleeping Dogs all feature built-in tools for benchmarking. For those who would rather do so with actual gameplay it’s recommended to use games which by their very nature are graphically intensive. Those which come to mind include Crysis 3, Assassin’s Creed: Unity, The Witcher 3, Battlefield 1, Project Cars, Watchdogs 2, Ryse: Son of Rome, and Quantum Break. The first step we’ll take will be to note down the specifications of the graphics card. Keeping things simple you’ll want to take a look towards the core clock speed and memory speed. This can be done with GPU-Z. Keeping with our GTX 1070 reference, the GPU features a core clock speed of 1683MHz which automatically rises when GPU temperatures are still relatively low, along with memory speeds rated at 2002MHz – 8008MHz effective. Begin by running your chosen benchmarking tool and take note of the frame rate results it displays when finishing. The next step is to increase the clock speeds of the graphics card. We do this by adjusting the core clock slider in MSI Afterburner, doing so in increments of 15MHz. Once this has been done, click apply and save. This is where the mind-numbing process of repetition comes into play as you will be required to run the benchmarking tool a fair number of times hoping to receive an increase in frame rate. As mentioned previously, you will want to be aware of the graphics card’s thermal and power limitations, as well as the performance gains that others of a similar setup have received from their overclocking methods. As the GTX 1070 has a maximum thermal limit of 94c you’ll want to keep things under control, not going beyond 85c just for additional comfort. This process of adjusting clock speeds at 15MHz at a time is one you’ll want to apply to the GPU memory speeds also. While memory speeds will not be able to be raised as high as the core speeds, it’s worth applying in order to maintain the additional performance received from the higher core clock speed. Annie Are You Okay? Are You Okay, Annie? While performance may improve as indicated by the performance results of the chosen benchmark, you’ll want to take extra precaution as to make sure you don’t damage the GPU. The best way to do this is to be on the alert for visual anomalies manifesting on the screen. This will present itself as pixelated blocks, coloured artifacts, slowdowns and crashes. In some instances the PC may actually reboot itself – a sign of the PC taking steps to reset the GPU to its default settings as it may have been pushed too far. In order to avoid this, you’ll want to down-clock the GPU should any of the aforementioned issues take place. While I don’t recommend this for beginners, increasing the power threshold of the graphics card can alleviate these problems. Adjusting the power supply to 110% will allow the GPU extra headroom to increase its clock speed as it will have more power available to support the higher clock speeds. 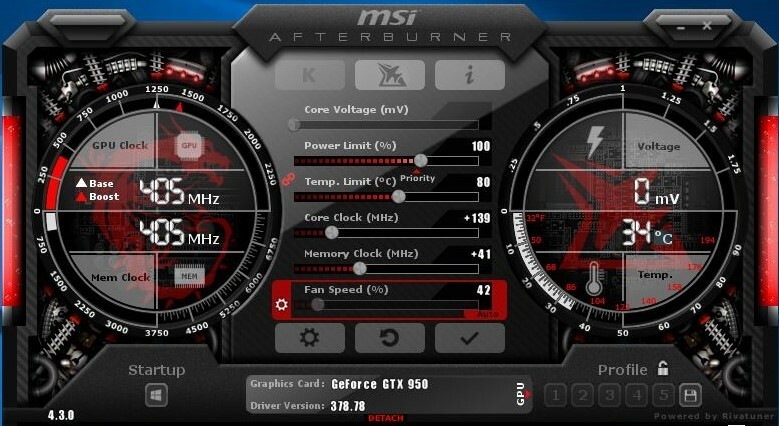 As the MSI Afterburner software will keep track of the graphics card’s current temperature, clock speeds and power readings as a means of assisting the user throughout their experience, additional features such as dynamic fan control, automatic-overclocking, and profile savings for specific games can also be applied. This proves useful for acoustic tolerance and thermal adjustments for what the user will be comfortable with when overclocking their graphics card. Other software may also feature options for lighting control if the graphics card contains the supported technology. For those who wish to keep their overclocking settings each and every time they boot up their PCs, MSI Afterburner can be set to apply overclocking upon system startup. That’s it, you’re done. Free performance without spending extra cash. Let us know how far your graphics card can go and be sure to share this article with your friends. For a great selection of overclocked graphics cards from both AMD and Nvidia, check out Dino PC for the latest range: Graphics Cards.